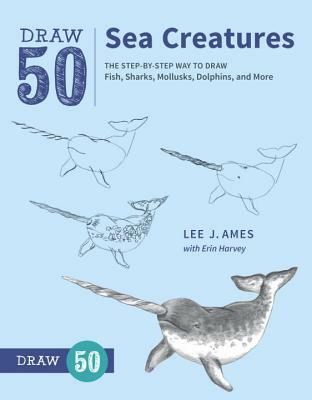 Part of the best-selling Draw 50 series this step-by-step guide to drawing various fish, sharks, oysters, bottlenose dolphins, crabs, polar bears, coral, and other ocean life is for artists of all levels. In this new installment of Lee J. Ames's beloved Draw 50 series, readers will find easy-to-follow, step-by-step visual lessons on sketching and rendering all kinds of sea and ocean-dwelling creatures. Animals and plants from in and near the water featured in the book include clownfish, whale sharks, sea otters, dolphins, turtles and more. LEE J. AMES began his career at Walt Disney Studios and taught at the School of Visual Arts in New York City and Dowling College on Long Island, New York. He directed his own advertising agency and illustrated more than 150 books, ranging from preschool picture books to postgraduate textbooks. A prolific author of more than thirty Draw 50 books, Ames died at the age of 90 in 2011. ERIN HARVEY is an artist who works primarily in pencils, charcoals, oils, and pen and ink. She lives outside Atlanta with her husband, Ben, and their two children.